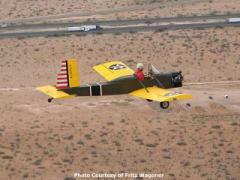 Fritz Wagoner flying his VP-1 over the desert. In June of 2004, after a few months of research and planning, I began construction of an Evans VP-1, also known as the “Volksplane”. This all-wood single-seat aircraft was designed to be easy to build and easy to fly. There is no kit, only a detailed set of plans, from Evans Aircraft. I chose the Volksplane because it is built from materials I’m comfortable working with and the simplicity of the design appealed to me. Because there’s no kit, there’s no large up-front cash outlay; materials can be purchased when needed. The Volksplane above is owned and being flown by Fritz Wagoner, who has graciously permitted me to use this photo (taken by his friend Morry Drexler from a Citabria). 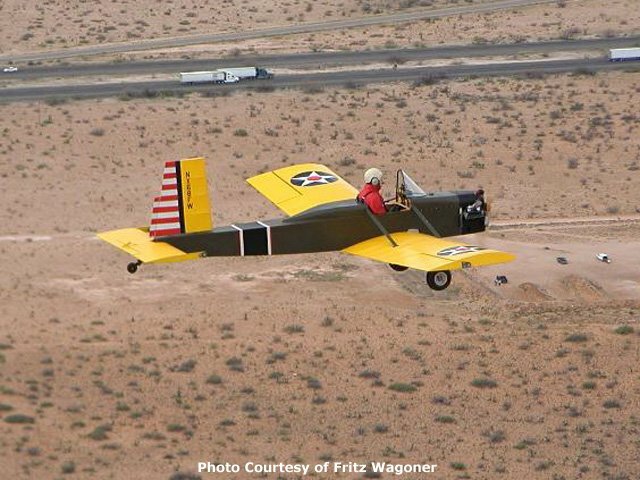 For more Volksplane photos, see my inspiration page, check out Fritz Wagoner’s Volksplane Page, or visit the Evans Aircraft web site. I plan to take my time with this project, hoping to finish it over the course of several years. Working on it a bit at a time, it will eventually be finished. This is a bigger project than the model airplanes that I’m accustomed to, although it is in many ways very similar. Just bought the VW 1600cc flat 4…gearing up to tackle this myself. What did you decide on for prop diameter and pitch? Somewhere around 52 X 28 Wood? This engine puts out 60 hp and is lighter than most VWs. At first my compliments for youre site! I,ll also want to build a VP1, and i,m wondering if i can juse a BMW R1100RT engine (80 HP) instead of a vw engine. What do you think? Both engine,s are air cooled anyway, so… Thanks allready. Hello,can I get the wood from other places than “Aircraft spruce specialty”?can I get same wood at home depot or Lowes? Thanks! Hernan, you can get _some_ wood at Home Depot or Lowes. For instance, many of the (non-structural) pine pieces are from there. However, you will not be able to find aircraft grade spruce, fir, and plywood at those place. For that, you’ll have to go to an aircraft materials supplier. Bob, I think the original VP-1 flew with a 1200cc engine, but I think most VP-1 builders consider 1600cc a minimum. Have been involved in several builds, even started a vp-2 back in the sixties, but got married instead, now looking for an easy build, wood, removable wings, simple, want to buy Evan’s plans but need to make sure it has what I want, CG information. Could you tell me if the plans had CG info? Thanks. to where I might find for sale, I don’t see a lot of them around! Can i take a vieuw one time at youre plane? Wan,t to take some mesurements. Thanks Mate! Greetz Gerald. I have the plans for the VP, but I am 6 feet 4 inches tall. I sat in one that was for sale…….. enough said. So I sat down with paper and pencil, and scaled up all the critical parts of the plans . Extended the fuselage by 4 inches between the spar centers, wider by 2 inches. I may actually build it someday. Robert, expanding the fuselage between the spar centres means you need to expand the wing too. That’s a pretty major redesign IMHO. I spent a lot of time working on building the fuselage 4 inches in longer between spar centers, and I came up with a formula, it is a multiplier. .08, if I apply .08 to every dimension of the airfoil, I can scale up the airfoil so nothing changes , except fuselage length. A 50 inch airfoil becomes a 54 inch airfoil but it’s shape changes not a whit. If you have a set of plans, go look at the airfoil page, and simply apply the formula. The shape of the airfoil will not change. My name is Carl Long and I live in Gunnison Colorado. I am 77yrs old and have most the parts for a Evans VP-1 at my age I will not complete this project but would like to donate it to a youth group that would be interested. Or would sell at a reasonable cost. Example all of the wing ribs are quality plywood and routed ready to put on the sitka spruce spars plus many other parts. If anyone is interested e-mail me at cllong75@q.com . just like someone finish the project. Thanks. Carl, it sounds like your VP is at about the same stage as mine (except I still intend to keep working on it). I hope you find a buyer! Robert, multiplying all the dimensions of the airfoil by 1.08 will indeed not change the shape, but it will change the stresses, and it will also not move the spars 4″ further apart, since they are not at the leading and trailing edge. Given that the spars are about 26″ apart, your multiplier will make them just over 28″ apart. What,s youre number? So i can call you. Is there a vendor that sells the rudder spar tube bushings? Stefan, just reading your comment section on my Samsung Tab 3. How is your plane coming? Haven’t worked on it in a while I’m afraid. I’ll probably get back to it in the new year. Too many other projects that keep attracting my attention. Sorry Allyson, I don’t have a pattern, but apparently one has been posted to the files section of the Volksplane group on Yahoo. I bought a 80% completed VP1 in 1990. Finished the project and flew it a little. Was flying twins and owned a Maule so hangar space was a problem and sold it. The friend that bought the VP from me was an ex South African airforce engineer who removed all covering , redone and painted all woodwork and recovered everything in new.Professionally done. After he passed away i baught the plane back – But the original woodwork was done stronger than the plans specified and the all up weight came in more than the 750 pounds. The other problem i had was the C of G was right at the limit at the back. As you fly off fuel ( in front of the cockpit) the tail gets heavier. So i threw out the 1850 cc Volkswagen engine of approx 50 hp at sea level and now i am replacing it with a Rotax 582 engine of 65 hp. Now i can move the engine forward and get the C of G right and the engine is much lighter. Am corresponding with a guy in New Zealand that did this conversion and it flies hands off with more than enough power. Take a look on youtube ZK-EDA with VW power and then with the Rotax engine. How is it going? Already flying? 😉 Keep up the good work! Hi, great to see so many people with vp1’s! I am putting a vp1 back together and currently getting it LAA permitted (England) to fly once again after being stored for the best part of 10 years. Does anyone know if there are specific cable tensions to adhere to (ailerons, rudder and elevator) as I’ve bought the plans and can see no reference to these? Also has anyone carried out the modifications to the wing strut bushes to increase the MAUW to 800 pounds? Any ideas about where I could get hold of a wheel and a new set of exhaust manifolds? Kind regards Chris. How is it going? Already flying? Keep up the good work! I’m not sure why but this webkog is loading incredibly slow for me. I am medically retired on a very tight fixed income and I am huge 6’5″ 325 (Not fat but a big guy and I have lost lots of weight) I used to fly trikes back in the early 90’s, Yet have always wanted a quote unquote a real airplane. I have spent the last year going over what is available in my price range with an exceptable useful load. It always boils down to either a Vp-2 set up as a single seater or a Double Eagle. I am leaning to the Vp-2 because of my wood working experience- My question is can it be super-sized? I was planning to use a rotax 582 for weight savings. Anyone able to offer good ideas? My local EAA is full of snobs who don’t seem to know what a fixed income is while putting 3 kids through college. Enjoyed the VP-1 build log so far. Very nice work. Have you finished it yet? Seems your posts on the build stopped several years ago? No, I haven’t finished it yet. I keep taking on other projects (see the rest of my web site). I really, really, really plan to get back to work on it in the new year. I have a new impetus, in that the local flying club sold the planes that I normally rent, and I really don’t want to get back into flying boring old Cessnas. Looking forward to the rest of the project! Love your Web site, looking forwerd to following your progress. i just purchase a 2 VP-1 projects. One flying and the other about 50% done. Looking forward to working on both of them and getting them up and flying again. I seen several flying and enjoy the sight and construction of it. I am glad there is a good following of the airplane. I will looking forware to learning from yours and everyones progress on their projects. You have to make them yourself out of the appropriate thickness of aluminum. Hi, Is it possible to use Douglas fir 3/4 plywood instead of DF wood in the two fuselage bulkheads? No, the plywood won’t have enough strength in compression where the struts attach at the top, and in tension where the wings attach at the bottom. Daz with the Corvair powered VP 2 in Australia. What stage are you up to with the VP. Fuselage is almost done. Haven’t worked on it since November 2011, but plan to resume early this year. If you want some inspiration, and are anywhere near PACIFICA, CA, a friend and I are working to get a 1990 VP-2 flying again. You are welcome to take a look at it. We have the airframe that originally flew in 1990 apart and are working on the engine installation. The airframe is complete firewall aft. My friend got a Revmaster out of a KR-2 that we have mounted, fuel system hooked up, engine controls installed, and are working on the details of the electrical system. Once we get the engine running we will move it to Salinas for final assy and ground/flight testing. I’d love to come see it, but unfortunately am nowhere near California. My brother is kitting this airplane from aluminum sheet using Evans’ plans. He can provide individual parts or subassemblies as he engineers them. Drop me anemail and I can put you in touch with him. If permissible, I’ll post his contact info here. It’s a wooden airplane, so I don’t see how he could be kitting it from aluminum sheet. It would have to be completely re-engineered to make it out of aluminum. Enjoyed the VP-1 build log so far. Very nice work. Have you finished it yet? Seems your posts on the build stopped several years ago? Keep up the good work, mate! No, sadly it’s not any further along yet, but I’m finally completing some other long outstanding projects, and hope to get back to the VP in the next few months. I’ve only just found this website . But was very interested to read Stefan’s story. My VP-1, G-EVPI [google it] took 7 years to build and its now been flying 11 years. Both the build-up and the flying have been fantastic, rewarding experiences. You do occasionally hear the odd disparaging comments regarding VP’s. Take no notice of ’em. I have flown Tiger Moths ,Stearmans, J3’s SuperCubs, Aeronca’s, plus the normal bread and butter types. And guess which one is the most fun to fly ? The best tip I can give to a VP’er is, make sure you get effective aileron seals. Anyway, it’s Sunday June 7th 0800hrs and a lovely day and I’m off to Deanland Airfield, Sussex, England to fly my brilliant Evans VP-1 ! To the membership: How wide is the VP-1 fuselage at its widest and how wide is the firewall.Thanks. There is no membership Charlie. This is just my own build log. You might want to join the Volksplane mailing list on Yahoo, https://groups.yahoo.com/neo/groups/volksplane/conversations/messages, but I’ll try to remember to check the plans this evening. No. I haven’t started building the wings yet. Do you have any photos for the VP-2 restoration? I am interested in seeing any, thanks ahead of time. Well, the expected empty weight is 450lb, and the maximum gross is 650lb, so that leaves 200lb for pilot and fuel, so I’d say no. However, I’ve heard of people flying VP-1s at up to 750lb, but that still isn’t going to leave you any allowance for fuel, and most VP-1s end up over 450lb empty anyway. You might want to consider the VP-2, which is a 1.5-seater, but a lot of people build them as just a larger and roomier single-seater. Bill here i,ve been reading Stefan,s blog and read your,s do you, or did you get of the ground with your VP,and where are you[interest to hear]. I wanted to experience wood frame aircraft construction and fabric covering. I build VP-1 bulkheads and sold them. Then I built a rudder and covered it, shrunk it and doped it. Same with one aileron. They were built to spec and came out perfectly. It was easier than I thought. I then cut out wing ribs. I have at least a set for one wing, I can’t remember if I did both, but I routered them as per instructions on this site. I’m a fixed wing pilot. Time has passed. I’m 73, and want to sell the house. I need to find a home for these parts. They are pristine. I will give them away. The shipping could be a problem. My son, the airline pilot, says in the big boy airplane world the covered parts would need to be crated, padded and shipped via motor freight. The parts are 40 miles west of Pendleton, OR on I-84. I am Tod Files. We are in a canyon home in Idaho for the summer, but go back to Oregon often. 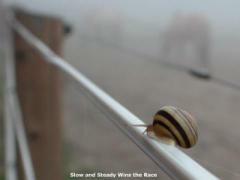 In Idaho we have a landline of 208-259-3545. e-mail is: tod.files43@gmail.com. If shipping is too much, I would cover part of it to just adopt out these parts. Any takers? Greetings, need deflection limits for vertical, horizontal and aileron on VP-1 and VP-2 Regards. I just bought the VP1 that Johan de Wet from Namibia talked about a few posts back and am in the process of getting it back in the air. I enjoyed following your VP build and was wondering If you had made any further progress yet. Hello, do you have a electric start. If so what battery would recommend. I bought a VP-1 that has a electric start on but no battery. Owner pass away, so info from wife. Great website and detail. Any updates on the progress of your Volksplane project? Are you continuing with it or have you moved on to other projects? Sadly, I haven’t worked on it in years. I keep finding myself drawn to other projects. However, it is still on my workbench, and I keep telling myself that I will get back to it. I do still fly regularly though; I haven’t given that up. Hi Folks, I was reading over the various submissions and found them quite enjoyable. I have built two VP 1s and have a VP 2 ready to fly with a Jabiru 2200 engine. This is my ninth project and am looking forward to flying open cockpit again. I put 200 hours on the first VP 1 and over 100 hours on the second one. I have built six taildraggers and have to say the VPs are a very forgiving and easy plane to fly. Best of luck to you all. I guess as we approach the end of mortality, priorities shift. I know this all too well. I have dreams that I know will never be fulfilled, but it gives me solace just to think of those dreams. I hope you get the VP-1 in the air, as it would be a shame for the effort that you have put in up to this point to be wasted. We have to get together sometime, as time is not stopping for anyone. Unless you know some math that can bend time. Hello I have purchased the VP1 plans and now thinking I should buy VP2 plans I’m 255LBS and i’m a thinking better get the bigger plans. I’m also thinking I will need a bigger engine like the VW 2200 or the Jabiru 2200. Anyone near Atlanta Ga. have a VP1or2 ? i sure would like to see one in person. The drawings do not show how to attach the aluminium leading edge to the wing. Do you know? I live up in NB canada and have a volks plane II for sale you can contact me at shermond8@hotmail.com plane needs motor and some minor finishing to be done contact me for pictures. It’s a question! On page #25 of the original, “VP-1 Volksplane Plans and Pilots Handbook.” There is a picture of a VP-1 with the caption “COLORADO”, the associated picture is of a tri-gear, open cockpit, VP-1. If anyone has any information regarding this aircraft or its owner; please give me a shout out, thanks. There is a VP-1 listed for sale in Ontario, Canada, for $3600. The ad says it’s almost ready to fly. It looks like a good deal.